Save time and energy with the VisionTek Productivity Series ATI Radeon™ HD 3450 graphics cards which provide optimal performance, break-through efficiency and stability. These graphics cards are a great option for business users who engage in video conferencing or use creative applications that require fast frame rates and exceptional visual quality. With platform-independent intelligent power management, the AMD Radeon™ HD 3450 Series graphics cards deliver the power needed to blaze through even the most intense applications while intuitively conserving energy at idle or when demand is low. Expand your visual workspace with multi- monitor support for advanced multi- tasking to help you get more done in less time. AMD also offers monthly ATI Catalyst™ driver updates and industry leading customer support for your ATI Radeon™ graphics products (some conditions may apply, check http://support.ati.com for more details). Small Form Factor design fits in today's Low Profile desktops and workstations (short bracket mounted on card). Card is convertible to standard ATX design with (included) tall bracket for standard chassis as well. Single slot, Dual Monitor support is now available for your Small Form Factor PC. 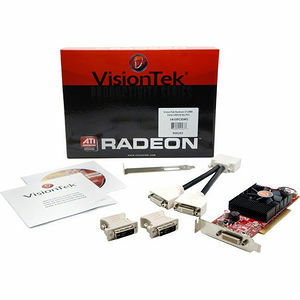 The VisionTek Radeon HD3450 DMS59 combines a radically new and efficient ultra-threaded core architecture with ATI's revolutionary AvivoTM video and display technology. Full support for Microsoft DX10.1 and DX9. The VisionTek Radeon HD3450 DMS59 delivers exceptional visual performance for all types of PC entertainment and productivity. Ideal for moderate 3D rendering, multimedia, multi monitor office productivity, and workstation applications.